Submitted by Stuart Peterson on Wed, 02/11/2009 - 6:03pm. Last night, progressives gathered at The Tank to discuss the topic of Michael Lux's new book, The Progressive Revolution. In addition to Mike Lux, MoveOn's Eli Pariser and Atlantic Philanthropy's Gara LaMarche spoke about what Lux calls the next "big change moment." Moderated by Laura Flanders, host of GRITtv, these progressive masterminds spoke to a packed room (people stood in the back and sat on steps). At the end of the discussion, the audience was invited onto the stage to mingle with Mike, buy books and drinks, and chat with fellow audience members. Mike's literary agent, consultant, and chief of staff all came to the event. 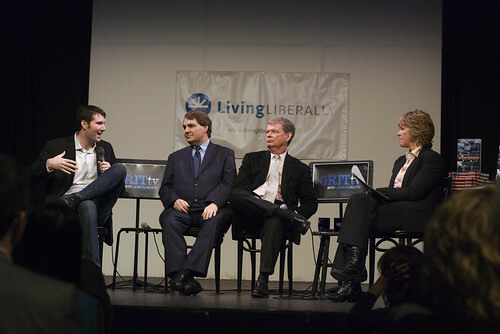 From the audience, I met several lively liberals who required little encouragement to share their thoughts. Discussion topics varied, including responses to the talk, debate over the stimulus package, the future of feminism and worker's rights, and hopes and fears for Obama's term. Dedicated discussions closed down The Tank and were transplanted a block away to Drinking Liberally's regular haunt, Rudy's. 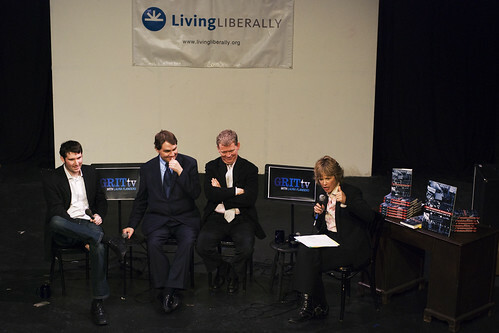 Eli Pariser, Michael Lux, Gara LaMarche and Laura Flanders discuss progressive revolutions. 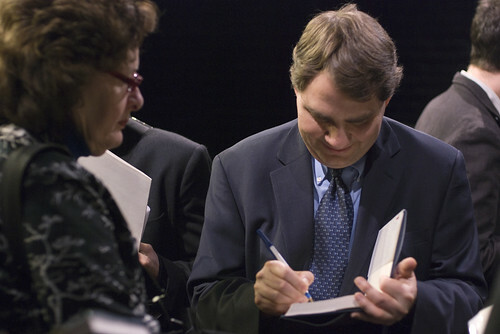 Michael Lux signs a copy of his book "The Progressive Revolution: How the Best in America Came to Be" after the panel discussion. 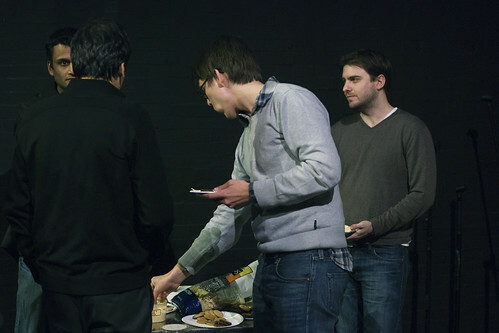 Event attendees enjoy a bite to eat after the discussion. Submitted by iavora vlaytcheva (not verified) on Wed, 02/11/2009 - 6:19pm. Living Liberally <3s Whole Foods.